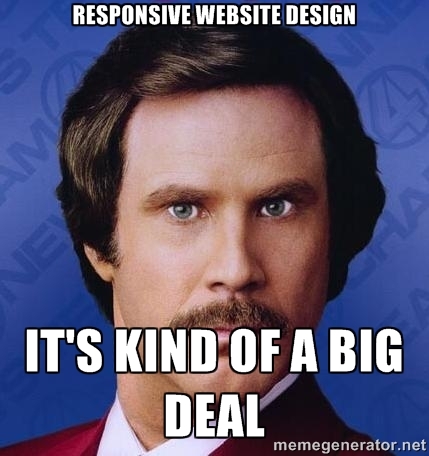 Home » Blog » What is responsive web design and why does it matter? In 2017 people access the internet via all sorts of means. There are smartphones, tablets, laptops, even televisions. The resolution of these displays can be different, as can the orientation, so it’s important to design web pages for each device to make the user experience as easy as possible. But in the modern world where there are so many new devices, each with different resolutions, web designers used to have a hard job keeping up. However, this is where the hero of responsive web design comes in. Responsive web design is when the webpage is built to respond to the screen size, platform and orientation of the user’s device. To achieve this, the website developer would program a number of CSS media queries, and use a variety of a mix of flexible grids, layouts and images to achieve a dynamic design. This basically means that once the developer has completed the appropriate code, the web page should respond to the user’s behaviour, and the screen on which it’s being viewed, including the size, platform, and orientation. Because this has to be built into every page of a website, it is best to build in responsiveness to the site during initial build rather than having to go and add it in later, which can be very difficult and time-consuming. For instance, a user could view a webpage on their laptop, and then view the same page on their tablet, and the page would automatically switch to accommodate the change in resolution. Doing this successfully means there is no need to develop a new website design and layout for every new device that enters the market! Different devices often have different screen resolutions and orientations, and this makes it difficult to display the same content on them. On top of this, when on desktops, people often don’t maximise their browsers, so this leaves an almost infinite number of possible screen sizes. One way around this is to make everything on your webpage flexible. Images can be resizable, and there are a few workarounds so layouts never break. It essentially means having a mixture of fluid grids and images that move closer and further away depending on the resolution of the screen they’re being displayed on. Another aspect which needs to be considered is that images will have to be resized depending on the screen resolution. Fortunately, there are a number of techniques that can be used to resize images using CSS coding. For extreme changes in size and orientation, it may be best to rethink the layout altogether. It’s possible to have an entirely separate style sheet, or use a CSS media query to translate the same style to a different size or orientation. Sometimes you can try your best to replicate a desktop webpage on a mobile device, but there comes a point where you don’t want all the information displayed on a desktop site to appear on a mobile site. This may mean hiding some of the content within menus and buttons to be expanded as needed, so that a small mobile screen doesn’t get too cluttered and users can choose what they see and what they don’t see. In a mobile environment you’re also going to be more inclined to show text in rows, rather than multiple columns, just to make it easier for users to read. At Bright Design, we only build responsive websites since it is now so vital that all our websites are fit for use on any device or application. As mentioned earlier, building responsiveness back into a site is far harder than integrating it in the initial build, so our developers take the time and care to hard code this in with every website. If you’d like to find out more about the sorts of websites we build visit our web design page or our blog for more information. Alternatively, if you are looking for a professional website development company to build you a site, do get in touch with our friendly team who are always happy to help!